The Upper School student club D-E Soles is leading a sneakers drive on behalf of Soles4Souls, an international nonprofit that creates jobs and provides relief through the distribution of shoes and clothing. The drive is underway now through next Friday, March 17. Sneaker drive collection boxes are located in Leggett Hall by the Upper School office, Klein Campus Center, and the lobby of Imperatore Library. Questions about donations can be directed to D-E Soles Club student leader Carson Todd at todd@d-e.org. To download an information flyer about the D-E Soles Club drive click here. You may have seen our robotics team hard at work on the first floor of the Hajjar STEM Center. You may not have seen them, as I did, at 9:00 PM on a recent Friday night, doing their not-quite-final preparations for the New Jersey State Championship Tournament that took place a week ago. The entire Taub Innovation Floor was abuzz with the physical work on the robot, students trying to finish a new appendage designed to lift a beachball, some working on the gears, some weaving wires to hold the ball. Located at different computer stations around the floor, other students could be found creating the proper coding to make the robot do what they wanted. The work of this group has been truly remarkable. I want to share with you their newsletter, and congratulate the team on its victories in recent competitions. Although they did not place as well as they wanted in their final tournament, they agree that they had a very successful season. By the way, I urge you to attend one of these competitions some time. You will be amazed by what you see. Beyond the battles of the bots themselves are all the team efforts going on at the work-stations of each competitor, and the interactions between teams as they make alliances throughout the competition. It’s vibrant and powerful. It has been Wellness Week in the Middle and Upper Schools, and the D-E Health and Wellness Department organized a host of events to promote wellness, ranging from working with the kitchen staff for an especially healthy meal and smoothie to special classes and presentations designed to help us all think more deeply and critically about wellness. Fitness competitions, lessons, even an advisory walk-a-thon on Leggett Field served to emphasize the importance of overall wellness. The department’s efforts support the School’s developing focus on life-long health, a direction in which we are moving with increasing speed. Related to the wellness initiative, students in the Upper School met in groups to consider gender issues with an outside specialist. 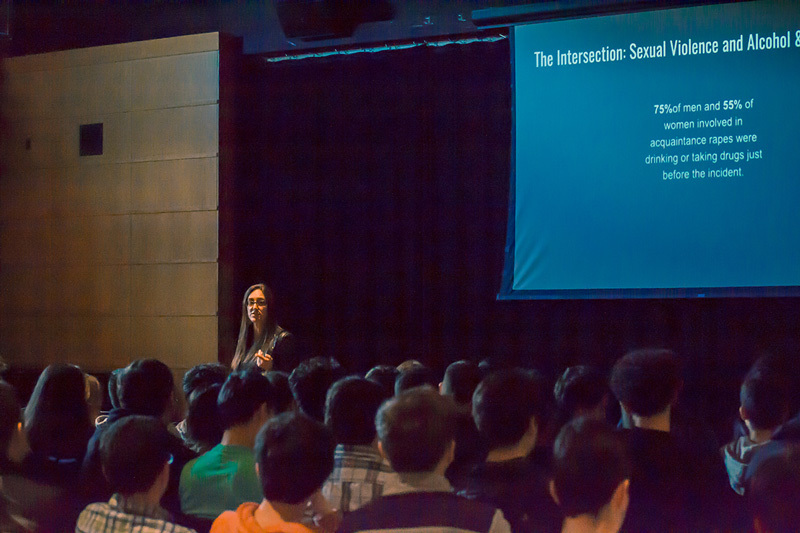 In grades 9 and 10, these groups contained about 40 students each, and the conversation aimed to help both males and females to better understand issues that take place between the sexes. Some of our students and faculty recently attended a workshop with Lauren Hersh, our facilitator, and upon their return extolled her ability to relate to both males and females, and to generate important conversation and awareness. Lauren conducted focus groups with students from each grade last month as well as with the deans, and she crafted her presentations accordingly. She addressed issues with our students such as gender expectations, consent, sexting, social media conduct, and cyberbullying. The conversation was aimed to help students closely examine these topics and identify ways they themselves can help create a more positive school culture. For the older two grade levels, Lauren provided a developmentally appropriate lesson about consent and the aforementioned topics. Lauren also spoke with the faculty on Wednesday afternoon on ways to help students process the information and carry on the discussions as appropriate. Our D-E Parents’ Association (PA) and PA Class Rep volunteers will soon be sending you information about a follow-up discussion with Lauren in April, specifically for parents/guardians. Ask your child about his or her session. We’d love your feedback and look forward to your participation in the April session. Grade 9-11 parents/guardians are reminded of our ACADEMIC SCHEDULING PROGRAM ON MONDAY NIGHT, March 13 @ 7:00 PM. Monday evening you are invited to a session of how to make course selections with your child for next year. The deans will speak about the overall curriculum and also narrow in on the different choices that are available. For present tenth and eleventh graders in particular, there are many options for building courses, and we hope you will join us to hear both the big picture of how to approach these choices and the specifics of departments and courses. The evening will begin at 7:00 PM and all grades will be meeting in rooms surrounding Hajjar Auditorium. For interested parties, this event will be preceded by a college roundtable in Hajjar from 6:00 – 7:00 PM. We hope to see you there.